The chairs come very well wrapped without need to assemble anything. They look like more expensive bistro chairs at a fraction of the price. The chairs have a comfortable arm rear without the profile of the chair being too bulky. 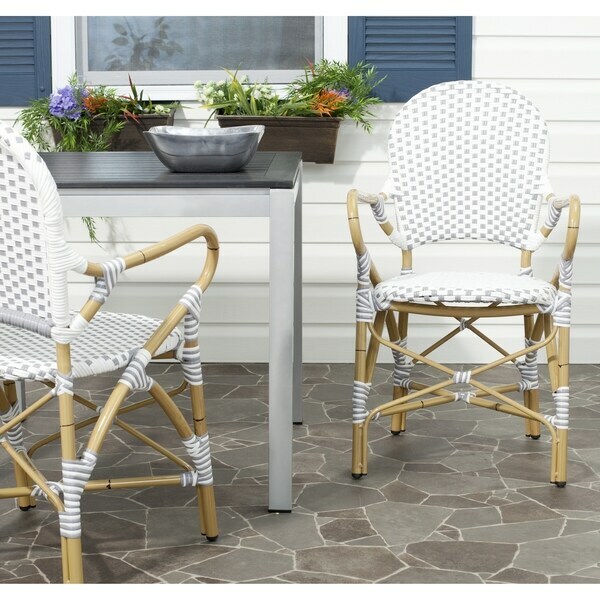 The beloved European bistro chair assumes a coastal cottage vibe inthe grey and white Hooper indoor outdoor stacking armchair bySafavieh. The cheerful woven PE wicker seat and back extends topretty wrap detailing on the faux bamboo frame of this classicallystyled chair. Dimensions 35 in. H. x 20.8 in. W. x 21.6 in D.
LOVE these chairs! I bought these chairs almost a year ago for my south Florida patio. They still look brand new. The white has remained bright white (I was concerned they would yellow). The chairs are comfortable and sturdy. And the best part, no assembly needed, just open the box and take a seat! High quality and light weight, I wish that this had the side chair version to match, either in grey and white or simple white! These are super cute, high-end looking chairs; however, I don't know why everyone loves them so much (incentivized?) because they are TOO SHORT for my 42 inch round PB kitchen table. The dimensions listed are confusing. (Read closely: the seat depth measurement is different in two different places.) These made me feel like a kid at the grown-up table, which is a shame because they are actually adorable, well-made chairs. Sadly, I have to return them; but they would work great with a more diminuitive table. Love the look of these chairs and the overall quality is great. In my opinion, they seem like they could be about an inch higher to look a little more substantial next to our large zinc top outdoor table… we're considering adding wheels to the legs to raise them a touch. Also, they are definitely made for a more petite person. totally reminds me of Parisian cafes! great grey and white! love! I saw the armless version of this chair on a "famous" blogger's site. These are so cute. They really do remind me of the chairs in a little European sidewalk cafe. They stack also, so they can be easily stored and pulled out for extra seating. I have these chairs in my white, grey kitchen with stainless steel appliances. They look great, are very comfortable and adds a stylish Parisian look to my kitchen!! Thank you Overstock for selling wonderful items!! Love these chairs. 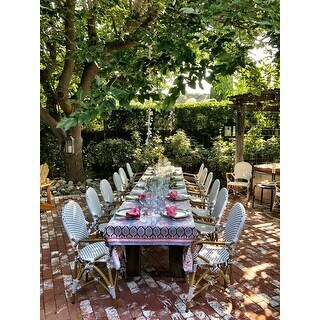 We use them outdoor and also bring them in for extra seating. Easy to clean up and look adorable. Great purchase, highly recommend. These chairs are very comfortable and stylish. I am using these at the head of a long farm table with the armless chairs on the sides. I had them in the hot sun and they were still comfortable to sit on. Great value for the two chairs. Good looking chairs, comfortable to seat. Great looking well made comfortable chairs! Love them! I like the price a lot and the chairs are very comfortable. I would have paid extra if the frame was real bamboo. They are low profile and perfect for our small balcony. These chairs are very versatile and have a wonderful, modern look. A nice addition to any room. One chair was perfect. The other was totally defective and should have never left the factory. The bottom was all messed up and one leg was shorter than the other three. Overstock quickly responded to the problem and arranged to have them picked up. Unfortunately, they are no longe available at this time. Gorgeous chairs! Arrived perfectly in great packaging and they look wonderful for our dinner parties! Comfortable and gorgeous - you cannot beat this price! Love them! "Are the arms strong enough to support someone around 110lbs using for support to stand up?" The weight capacity for the chair overall is 500lbs, but we do not have a weight capacity specifically for the arms. "Can anyone tell me the height from floor to the top highest point of the arms? I need to be sure the chair arms can fit under my table which is a bit lower than normal.."
"What is the arm height?" The arms are 16 inches long. The seat height is 17.3 inches. "I love these chairs but am looking for a counter height chair. Do you carry this in other heights?" These chairs are not currently available in a counter height. "What is PE wicker? The legs look like bamboo? Are these all-weather?" Polyethylene is a perfect material for use in outdoor furniture, this synthetic fiber is extremely resistant to outdoor elements. This is a PE wicker and aluminum product.